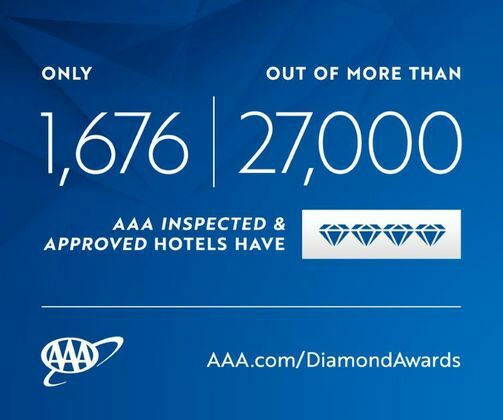 Four hotels have proven once again that they are Louisville’s hospitality “gems,” according to AAA East Central. 21c Museum Hotel, Louisville Marriott Downtown, Marriot Louisville East, and Embassy Suites Louisville Downtown have earned the AAA Four Diamond Award for excellent service, and opulent décor. 21c Museum Hotel, 700 West Main Street, a Four Diamond hotel since 2008. Louisville Marriott Downtown, 280 West Jefferson Street, a Four Diamond hotel since 2005. Embassy Suites Louisville Downtown, 501 South Fourth Street, a Four Diamond hotel since 2015. Marriott Louisville East, 1903 Embassy Square Blvd, a Four Diamond hotel since 2013.